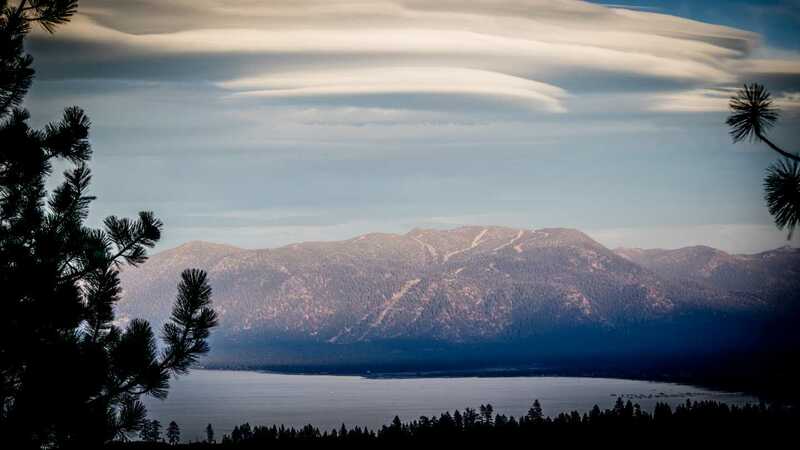 Without a job or a place to call home, I started my trek from the Mid-west to Lake Tahoe in the early 80’s. I crammed my meager belongings into a surplus Wonderbread truck with my only friend, a frequently car-sick cat named Edna. 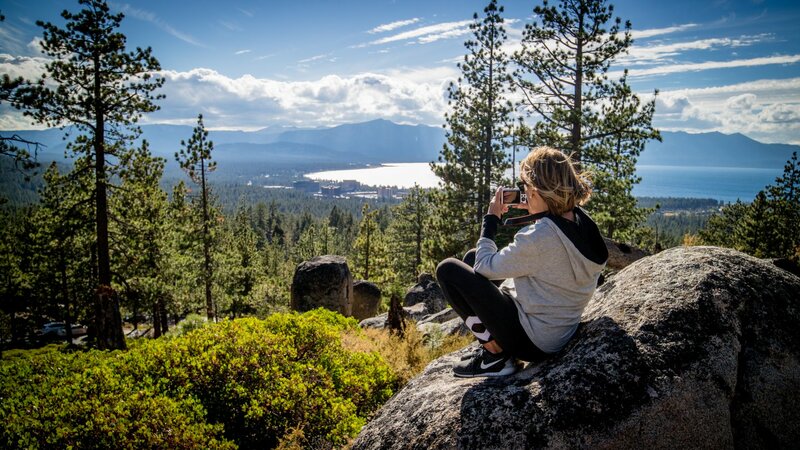 Determined to start a new chapter in my life, I pointed west towards the Sierras, guided by my love of skiing and desire to live in California. After days on Interstate 80, I veered off and chugged up Spooner Summit above Reno, Nevada. At 35mph, cars whizzed past in slushy defiance. We crested the summit as snow flurries revealed the vast expanse of blue-grey white caps spread out below– Lake Tahoe. Through the tears I realized I would never go back. I was home. Quickly hired as an instructor at a ski resort called Sierra-at-Tahoe, I realized my “dream job” of teaching kids how to snowplow wasn’t going to pay rent. I signed on as a bartender at Lake Tahoe Pizza Company. It provided good food and great tips, but also an unexpected perk– I was introduced to Chris, a young man who wanted to make snowboards, before snowboards were a thing. We flirted as he sketched primitive designs on cocktail napkins across my bar. Intrigued by his energy and the vision, we started dating, then became roommates, and finally business partners. We settled into a hobbit-like hut at the base of Heavenly Valley with views to Mt. Tallac over the Lake. We could watch the storms roll in. This became the center of late night brain-storming for Avalanche, one of the original modern snowboard companies. All attention was devoted to making rudimentary equipment. 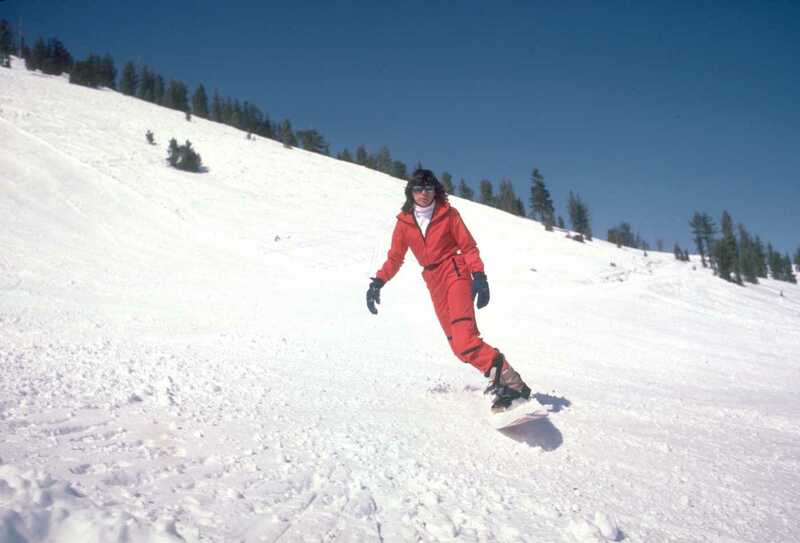 In fact, our first kitchen appliance was a pressure cooker used to mold plastic for snowboard bindings. Even our roommates were snowboard makers and Chris’ brother, Damian Sanders, our sponsored “pro-rider”. Probably a holdover from surfing, early snowboards had fins. The board I’m riding in the photo was one of the first finless snowboards. The bindings, molded in our pressure cooker, were paired with Sorel boots and ski boot liners. Background: When I first tried boarding, I couldn’t turn. I propelled straight down the ski run, yelling at people to get out of the way. Chris raced behind me, shouting to stop. Since we were at one of the only resorts that allowed snowboarding at the time, he feared my reckless riding would get us get kicked out, ruining it for all boarders. I was convinced I couldn’t turn because my board had fins. Skis didn’t have fins. Why did snowboards? To settle it, Chris found a rock and knocked the fins off the board. I stood, I pointed downhill, and made my first turns. From that day on, Chris applied finless ski-tech to the designs. His home-built presses were modified to include camber, sidecut, and metal edges. And that is how all boards are built to this day. When I look back, I can’t help notice how few female voices were heard in the early days of snowboarding. Remember, we were there, too, so I hope it inspires us to tell the whole story. Mine was a good one. Three decades later, I’m still in love with the man, the sport, and the Lake. Bev Sanders is founder and president of Las Olas Surf Safaris for Women and creator of Get Dressed and Go, a fashion and travel portal for grown-up girls. She started surfing at 44 continuing her lifelong pursuit of introducing women to sports. You’ll find her and husband Chris on the beach in Mexico throughout the surf season.